Melt 2 tablespoons butter in a large nonstick skillet over medium. Add spinach and 1 teaspoon salt, and cook, turning with tongs, until wilted, about 3 minutes. Transfer spinach to a plate. Melt remaining 2 tablespoons butter in skillet. Add eggs, sprinkle with remaining 1/2 teaspoon salt, and swirl to coat skillet evenly. When edges are cooked, drag cooked egg to edges of pan using a heatproof rubber spatula to form large, soft curds. Cook until eggs are nearly set, about 4 minutes. Remove from heat. Gently fold mascarpone and 1/2 cup Fontina into eggs until cheeses are melted. Preheat broiler. Place egg mixture in a shallow 8-inch square baking dish. Sprinkle wilted spinach and remaining 1/4 cup Fontina on top. Broil until cheese is melted and bubbly, about 5 minutes. 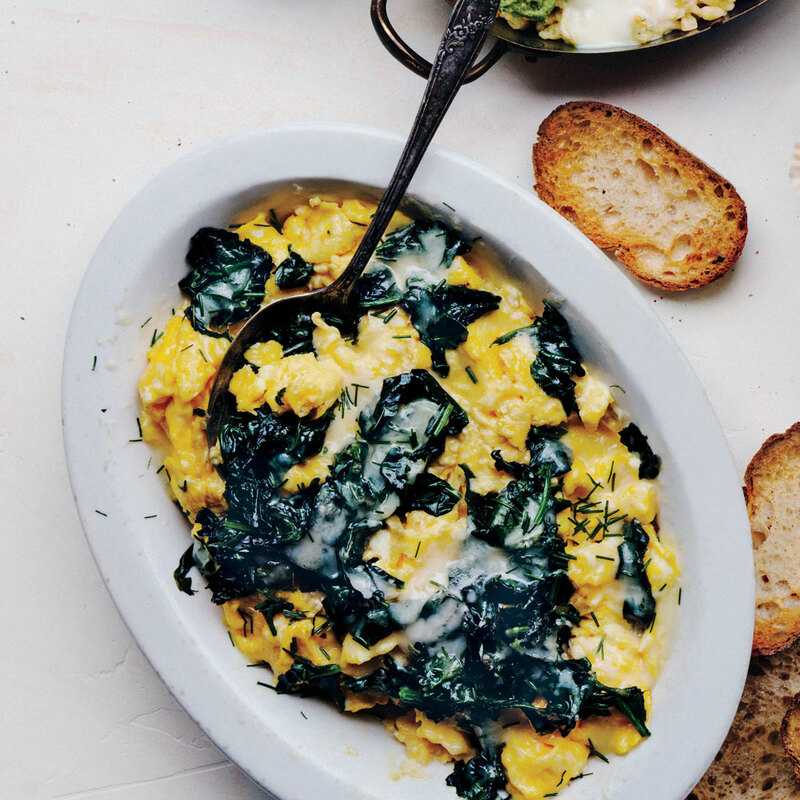 Garnish with chives and black pepper, and serve immediately with toast slices.